So as I'm packing stuff up and preparing move, I can't help but get my daydream on about decorating my very own place. I've procrastinating my packing with a little bit of Olioboarding to create inspiration boards for what I might do in certain rooms of my next apartment. I decided to share the bathroom inspiration board first. I'll be using a gray, white, and yellow fabric shower curtain from DENY Design that I received a long time ago but haven't been able to use. 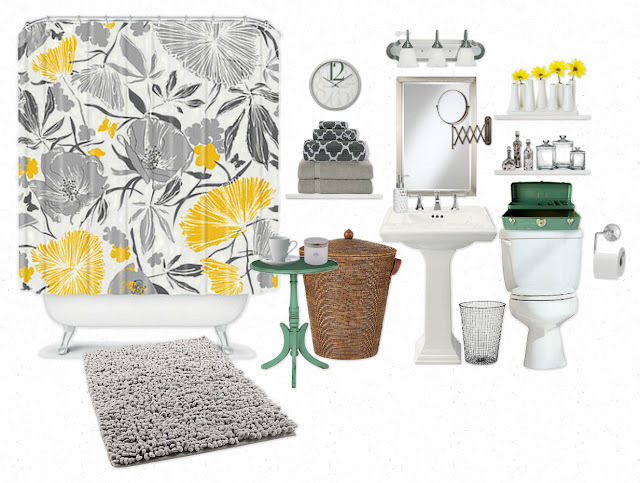 I'll keep most of the accessories (rug, vanity items, waste basket, towels) in the gray and white color scheme, with a few pops of yellow to pick up on the shower curtain. Then I'm going to add a bit of forest green here and there to match the vintage metal toolbox that I keep all of my makeup in. I will probably add a wicker laundry hamper for a touch of something natural and rustic. I also plan on spray painting a small wooden table a green matching the toolbox. I'll place it near the tub to hold a thing of bubble bath, a candle, and my teacup for long evening bubble baths. Yay! It'll be such a lovely little retreat! I love these colors! the yellow and green are so cheerful! I've got this color scheme going in my guest room right now and I love it! It's clean and crisp, but at the same time, there's something almost vintage about yellow and gray together. It can be girly and masculine at the same time. Target's got A LOT of stuff that fit in great with these colors. Where did you make this collage? It is so cool.